The death toll from the strongest earthquake to strike Papua New Guinea’s rugged interior in almost a century has climbed to 31 and would probably rise further, officials said Thursday, as damage to roads, runways and phone lines slowed relief efforts. 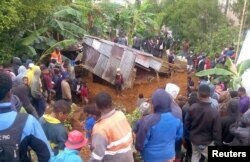 Remote hamlets closest to the epicenter of the 7.5 magnitude quake in the Southern Highlands were buried, killing 13 people, said James Justin, a research officer at the Ministry of Petroleum and Energy in Port Moresby in an email, citing a two-way radio call from a mission station in the region. Most of the other confirmed fatalities were in or around the provincial capital of Mendi and the town of Tari 40 km (25 miles) from the epicenter, where aftershocks continue to be felt and people afraid their homes may yet collapse have been sleeping in their yards. “Tari is completely shut down,” Mark Mendai, head of the district’s Development Authority told Reuters by phone. Locals surround a house that was covered by a landslide in the town of Mendi after an earthquake struck Papua New Guinea's Southern Highlands in this image taken Feb. 27, 2018, obtained from social media. A spokesman from the country’s National Disaster Center said a preliminary damage assessment from the quake, which struck the mountainous Southern Highlands about 560 km (350 miles) northwest of the capital, Port Moresby, was still incomplete. Australia has promised tarpaulins, water purification tablets, and water containers, and dispatched a military C-130 transport plane to assist with aerial surveillance. Miners and oil and gas companies were also assessing damage to their infrastructure, including a 700-km (435-mile) gas pipeline that connects to a coastal liquefaction plant, but were hampered by bad weather according to Oil Search Ltd.
Quake damage shut the region’s biggest airfield at Komo, built to supply remote Exxon Mobil Corp facilities, though bush airstrips were accessible and Mission Aviation Fellowship (MAF) evacuated four people to Mt Hagen. “As we flew and photographed all that we could see, we prayed for those below that had been affected,” said Connie-Lou Aebischer from MAF.